Next week I will turn 50. It feels just a little bit like Old Age is creeping up on me! Although my good friend Margrit just told me the other day that 65 is when the real challenge begins. And I doubt I will feel a whole lot differently when it’s no longer 49, but a five in the beginning. When I turned 24 I had a really serious time about that change. But it was also one of occasions when I actually celebrated – I was a teaching assistant at Holy Cross College at that time, mostly campus bound, and invited a few friends out to dinner. This time I am not afraid, although a couple of times I have jokingly referred to myself as ‘aging’. Indeed – my eyesight is changing faster than the insurance company is willing to pay for a new set of glasses. Last time they were willing to pay I was still too vain to go for bifocals, just got myself a new set of glasses for driving. 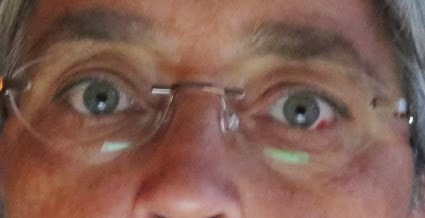 Now my reading abilities have gone down further – and solely due to eye issues, nothing mental yet! - so I had to get myself some “reading glasses”. 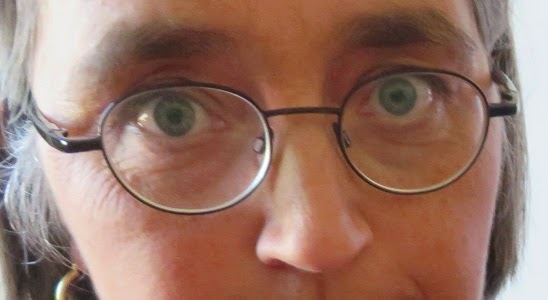 And old age immediately struck in that I in those three weeks since I got this extra pair of glasses I have already had several days when I did not exactly know where to locate at least one pair of the three that I am juggling with now. Certainly, turning 50 does not feel in any way as I expected it to back then when I turned 24. Just about at that time I first met a college teacher through taking a class from her who, in her position as a university teacher, to me seemed – well, not exactly elderly, but certainly she must have been much older than I was! (She was 36, or 37 at the most.) We got to be friends over the years, stayed in touch – and by now I am about 15 years older than she was when we first met, whereas she just retired from teaching last year. Talking to the young people from Syria whom I have spent a lot of time with lately, I must admit that I think I don’t feel much older than them on the inside – but I am pretty sure they look on me similarly as I did onto that teacher of mine. (If not 'worse', because I could be their mother, and although they haven’t told me, I am pretty sure their mothers are younger than I am.) And then a now 10-year-old boy in the house, who is definitely entering puberty and he, too, a taurus, and arguments aren’t getting easier or less frequent. He has a strong opinion, and a good command of language in terms of argumentation... So at least 50 is not going to be boring, which I once thought it might be. After all, most of the interesting things in life will have happened by that time, won’t they? But statistics say I have at least another 30 years ahead of me. Let’s see what those years bring. Can’t all of them be boring! -and a previous long distance pair I have at the computer because neither long-distance or reading worked there! You will find specific places to keep them where they are most needed, I am sure. Thanks, Sandy, for the encouraging words. We'll just have to see how long it takes before I develop a more efficient system of keeping them than 'in the other place where I am not'! But good things take time, no pressure. A "senior" at 50? no, no ... I don't know when "seniorhood" starts. I remember being 50, round about the millennium, and it doesn't feel much different now, except occasionally when looking in the mirror ... and forgetting about my own age when with young people - as you say, they see us as the same age as their parents, and I for one am rather older than their parents! It's hard to know where the meeting point with those young people is, but certainly a common interest (such as quilting, and many other things - birdwatching?) breaks down the age barriers. It's so important to move out of one's age group, I think. Belated birthday greetings. Turning 50 is actually quite liberating. So is moving onto varifocals which means that I only have one pair of glasses to worry about!